Did the class Healthy Cooking on a Budget fill up before you got a chance to register? Well have no fears. I’m here to give you the inside scoop along with a delicious SCNC recipe! The SCNC recognizes that eating well on a budget, especially a student’s budget, can be quite challenging. Each week Lauren Ferraro MS, RD teaches BU students how to stretch their dollar and get proper nutrition at the same time. Tofu is a soy product that is made in the same sequence as cheese making. The difference between tofu and cheese production is that cow’s milk is used to make cheese and soy milk is used to make tofu. Found in many different forms, tofu is a versatile vegetarian protein. It can be eaten raw or prepared by almost any cooking method. Tempeh is also a soy product. Unlike tofu, tempeh is a fermented soybean product and must be cooked for consumption. Tempeh is often enjoyed marinated, steamed, crumbled or blackened. Seitan is primarily made from gluten. To add texture and flavor beans, nuts or vegetables are usually added to seitan. Seitan is often fried, grilled, broiled or roasted. Beans are probably one of the most familiar and cheapest sources of vegetarian protein. Almost any type of bean can be found in canned and dried forms. The SCNC dietitians recommend sprinkling them on salads and adding them to soups, pasta dishes and stews. Adapted from Barish, Ellenor. “SCNC Cooking with Meat Alternatives.” Boston: Sargent Choice Nutrition Center, 2008. What’s the deal with Isoflavones? Lauren also talked about the health benefits of isoflavones found in soy products. Isoflavones are phytochemicals found in soybeans and soybean products that have been shown to have certain health benefits. Although other plants contain isoflavones, soybeans and soy foods are the only foods that offer a significant amount of isoflavones. Studies in Asia reveal that young girls and adolescents who consumed at least 1 serving of soy a day through childhood reduced their risk of breast cancer from 25-50 percent later in life. It’s also believed that isoflavones in soy products improves artery flexibility and can improve overall cardiovascular health. Start cooking with vegetarian sources of protein with the recipe provided below! 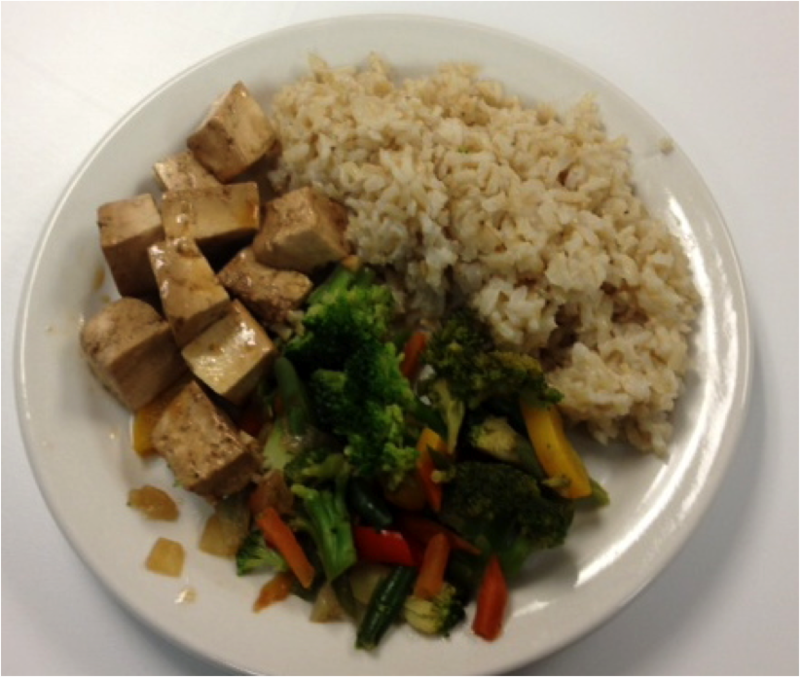 To create a balanced meal Lauren added stir-fried veggies and brown rice to the SC Easy Baked Tofu. SPICY TOFU: Add 2 to 3 teaspoons of Chinese chili paste with garlic to the basic marinade and reduce the soy sauce to 2 tablespoons. SWEET AND SOUR TOFU: Add 2 tablespoons of vinegar and 1 tablespoon honey, maple syrup or sugar to the basic marinade. Preheat the oven to 400˚F. Cut the tofu into slices, cubes, triangles or sticks. Lightly oil a baking dish large enough to hold the tofu in a single layer. Whisk together the marinade ingredients (or variation ingredients if using) and drizzle over the tofu. Gently turn or toss to coat thoroughly. Bake uncovered, stirring once or twice, until the oil is sizzling and the tofu is firm and chewy, 30 to 40 minutes. Serve hot, at room temperature, or chilled. Heat the canola oil and sesame oil in a large skillet. Add the tofu and sauté, stirring often, for 4 or 5 minutes, until lightly golden. Add the soy sauce and other marinade ingredients, lower the heat, and simmer for 3 or 4 minutes longer. Recipes adapted from the Moosewood Restaurant Simple Suppers, Moosewood Collective, Clarkson Potter Publishers, 2005.